Purpose: Use this document as a reference for how to enter employee pay increases using change percent in ctcLink. 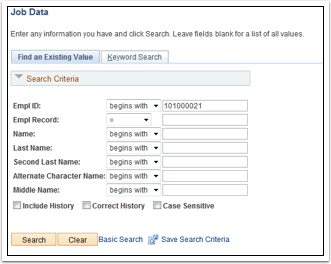 Use the Work Location page to specify information about an employee’s job, such as position, regulatory region, company, department and location.Information on this page reflects the last action for this employee. Enter the effective date of this change in the Effective Date field. The system will default to today’s date. Click the Compensation tab to enter employee compensation data. NOTE: The percentage shown above, is for this example only. When entering the percentage in this process you will enter the appropriate percentage for your specific individual. 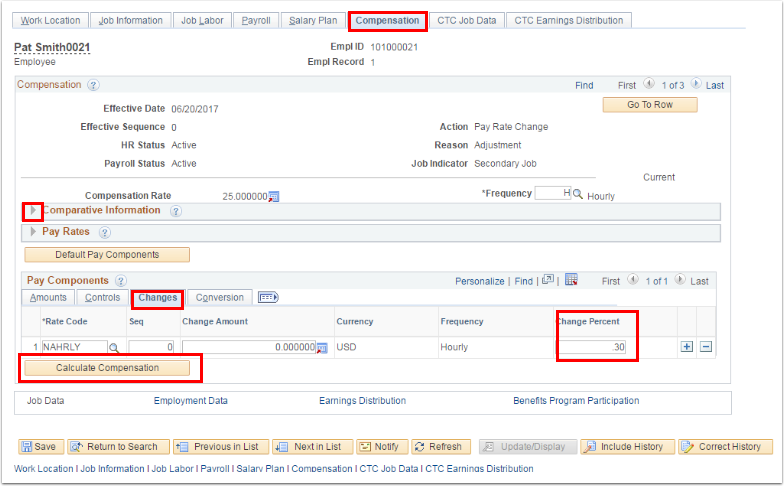 In the Pay Components section, click the Changes tab to specify compensation changes. Note: The Rate Code field contains the code or codes upon which an employee’s compensation is calculated. NAANNL and NAHRLY are the only rate codes currently used. The Change Percent field specifies the change in compensation amount by percentage for a specific rate code. Enter the desired information into the Change Percent field. The Comparative Information section displays the most recent pay rate change information.